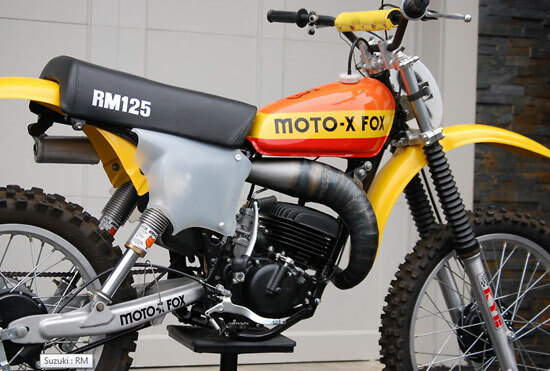 1977 Rm125 Suzuki, Moto Fox, completely rebuilt and restored. Sand blasted frame and powder coating gloss black. Complete motor rebuild, lower end new seals and bearing, top end new bore with new piston, rings and bearings. New seat foam and new cover, many new NOS parts, Suzuki “S” Bolts, adjusters, chain and sprockets, rubber parts, axles, etc. Newly rebuilt Moto Fox Air shocks by Thor Suspension, Rebuilt front forks, new wheel bearings, Wheels totally rebuilt, new spokes, rims and tires, also new steering stem bearings. New Cables, grips, fastners and I sure I’m missing something else. Now for the good stuff, optional aluminium factory 1977 swingarm, which was available from Suzuki. Cone welded pipe and new silencer, DC Plactics front and rear fenders, JT Replica translucent front number plate and translucent works style side number plate. Has a 79 cr125 air filter could be put back to orginal with a carb to filter rubber boot and a couple of other parts. Professionally painted Aluminium Tank with period Moto Fox colors. This bike was started and ran through the gears, sounds and runs great, ready to race or put on display, it’s that nice!